Worldwide, Collection, 1843-1936, massive 2 volume collection of foreign (not British Empire) stamps, a family collection started in 1906 by collector's grandfather and consolidated in 1937 into 2 New Ideal albums, consists of 1,244 pages with 23,959 unused and 21,407 used (unused on top of used) with a total stamps 45,366; extra good French and Portuguese colonies as well as all Latin American countries, just a few highlights to give you some idea of value; Austria 1910 10kr and a nice genuine Dolfuss (Scott $750); Belgium 1919 "Helmets" complete unused (cat $650), 1932 Caritas set ($1,000); Benin complete except Scott#15 (cost $710), Brazil #1 & 2 (cat $650), genuine and an unused 90R inclinado (cat $950); USA P.O. 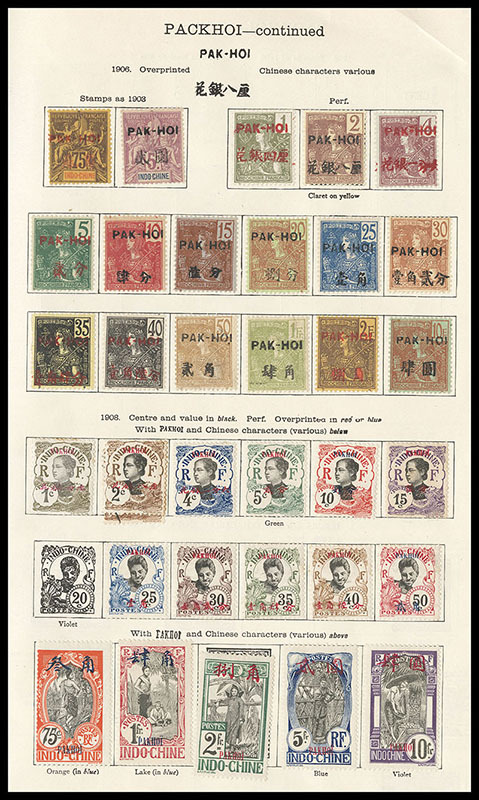 's in Shanghai complete ($2,100); Cirenaica complete unused 1923-1934; Dahomey complete 1899 to 1931, Diego Suarez from 1890 to 1894 (collection cost $885 at auction), Estonia complete 1919 to 1936; Fiume only 6 missing 1918-1924; French Guinea complete 1906-1931, also great Gabon, Germany 1872-1936 with only 8 missing, Haiti 1881-1936 only 2 missing, Iceland very nice including Parliament set 1930 (cat $475), Ivory Coast complete 1892-1934, Latvia complete 1918-1936, Lithuania complete 1918-1936 including 1924 semi-postals Scott B1-B42; Mauretania complete 1906-1933, Mong-Tseu nice earlies (cost $530), Norway 1855-1935 only missing Scott#41, Obock only 7 missing, Packhoi 1903-1918 Only 2 missing, Saar complete including all Flood Relief sets, Senegal 1906 complete ($300), Sicily complete, Spain and Colonies very nice, Sweden super including both 1924 sets (Sc #197-227, $575), Switzerland including complete Pro Juventute sets, Tripolitania almost complete including Tripoli Exhibition 1927-1931 sets, excellent Turkey and "Angora government", U.S. includes Kans-Nebr sets unused, Upper Senegal complete 1906 set ($310), Yunnan Fou much early 1903-1918 (cost $500), Zanzibar between 1894 and 1902 (cost $500), etc., also noted better China from first issue on, red revenues, etc. ; a truly massive 45,000+ stamp collection with condition well above the norm throughout, careful examination should prove very rewarding. 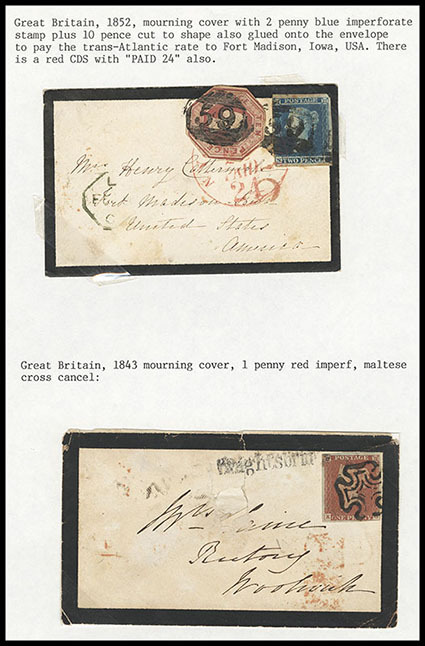 Worldwide, Mourning Cover Collection, 1833-1907, mounted collection of 66 mourning covers primarily from Great Britain plus Belgium, Canada, France, Germany, Jamaica, Russia, Switzerland, and others with some interesting frankings and a couple with historical import, noted includes GB 1d penny black #1 on 1840 mourning lettersheet, GB 2d blue and 10d embossed on transatlantic mourning cover to the United States, 1836 free frank of Fitzroy Somerset, Lord (Baron Raglan) Commander-in-Chief in the Crimea, etc., condition is mixed, but many interesting covers, please examine for full appreciation. Worldwide, Collector's Accumulation, large accumulation including one section of 19th and 20th Century mint and used separated by country which owner states Scott $30K, also hundreds of approval sheets with various sets and an assortment of topical material, careful review recommended, condition varies. 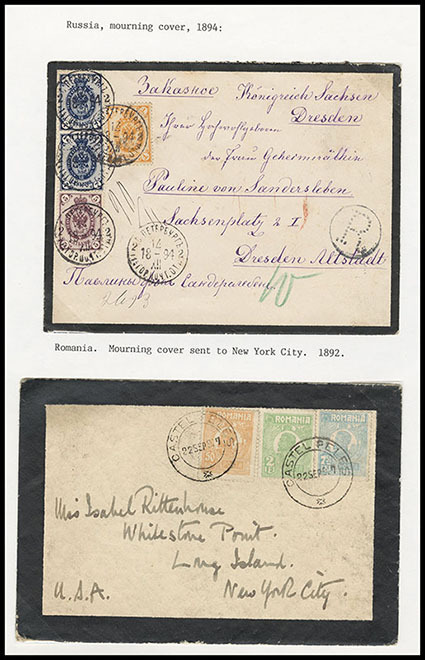 Worldwide, Better Balance, various singles and multiples on cards; includes early Egypt n.h. dues, Italy 1934 Soccer set, Switzerland Scott #76 block n.h., Eritrea J3a, Cyprus 1894 ½p damaged "S" variety (the corrected large "S" listed in S.G.), Nyasaland S.G. 142a, Canada #159, India - Charkhari sheets and a mint n.h. accumulation of Strait Settlements S.G. 231/231a in blocks; owners cat Scott $7,230 plus S.G. £3,363 and a few unlisted items. 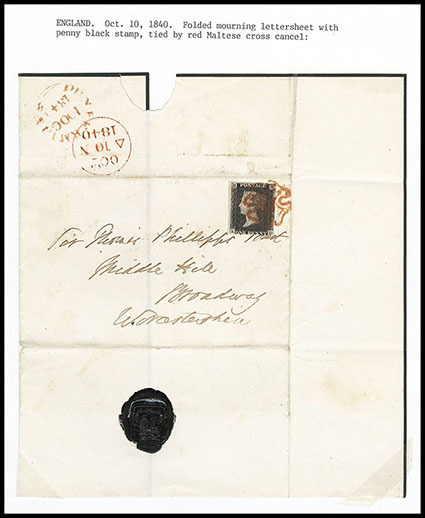 Worldwide, Cover Assortment, over 1,200 mostly older worldwide covers and postal stationery, includes airmails, registered, censored as well as many other types of postal history, all are sleeved and priced with prices totaling more than $20,000, great variety and generally F-VF. Worldwide, Better Balance, of various singles, sets, souvenir sheets and a few covers, includes Canada P.S.E. 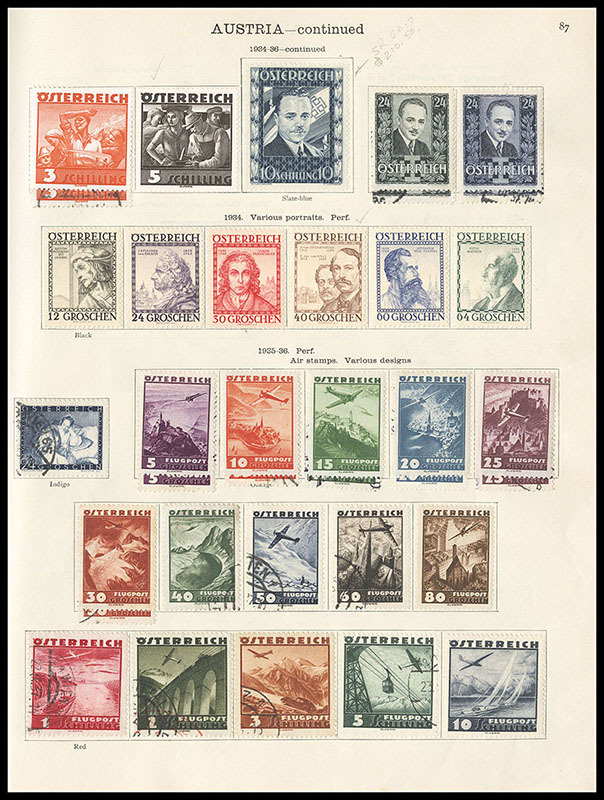 graded Gem 100 group and other better, German airmails including Zepps, Christmas Island sets in blocks, and a section of better Israel mostly n.h. tab sets; worth proper evaluation. Worldwide, Better Stock Balance, of 35 single and sets on dealer pages; includes Canada #38 mint (cat $1,600) and $5 Jubilee mint, KEVII set mint, etc., Faroe Islands #106 used, better Thailand Prince sets, German Area high values, etc. ; worth evaluation. 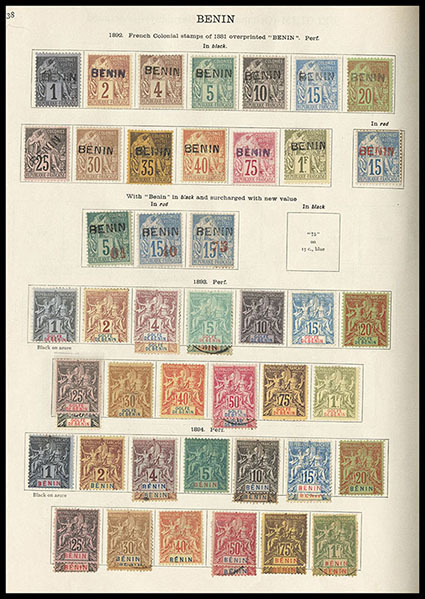 Worldwide, Mint Accumulation, thousands of modern n.h. issues in single, block and souvenir sheet format, various quantities includes British Commonwealth, French Colony, Africa, Australia, Pacific, Korea, North Korea etc. 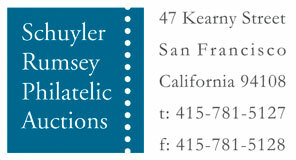 ; nice variety with much topical interest; Owner’s approximately. cat value of at least $20,000. Worldwide, Mint Accumulation, thousands of modern n.h. issues in single, multiple and souvenir sheet format, various quantities, includes Korea, Mongolia, British Colony, etc., much topical interest; owner's approximate catalog value $35,500; inspect. Worldwide, "Last of The ?" Sundry, accumulation of various in numerous binders filling two large boxes; including errors, inverted centers, imperfs, deluxe proofs, etc. ; many thousands of what you come to expect; inspect.